This is an uncropped (and much clearer) version of an image that was printed in the Holyoke Transcript likely in the 1970s, I do not have an exact date. This image is in my personal collection because my grandfather, Jimmy Smith (aka "Dirty Smitty"), is kneeling in the front row, far left. "Above is one of the early soccer teams that represented Farr Alpaca, when it promoted sports including baseball and basketball. It is timely because of the world title soccer match in London. Front row, Jim Smith, Gunner Moyer, Billy Dowdall, Jimmy Downie and Billy Hall; back row – trainer Andy Hutton, Hugh Hutton, George Burnett, Ed Ford, Joe Allen, Tom Moodie and Walter Dowdall. Youngster, head partly seen in the background, is Johnny Hutton, a former Transcript-Telegram compositor. The majority of players have passed on. Man in civilian clothes is Charley Burnett (deceased) who managed the club." I believe this to have actually occured somewhat later, probably not before 1920. This assessment on my part has to do with my grandfather's age as well as his involvement with other soccer teams that is documented by other dated photographs I own. In addition, the Transcript labeled this image "A Forerunner to Soccer" when it fact it was a groundbreaking team in the first American Soccer League, which was the first true viable professional soccer league in the United States. 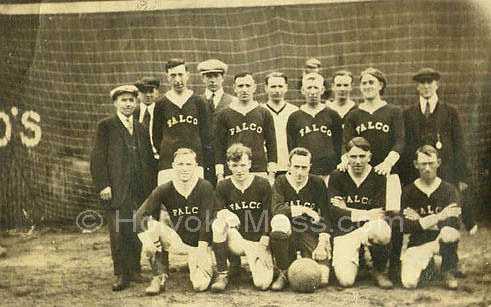 The Falcos had a presence in this league during the 1921-22 season. At the time the ASL was pretty much limited to the northeast, and Holyoke played teams from Brooklyn, Jersey City, Philadelphia, Pawtucket and a few other cities. Holyoke withdrew from the League after only one season, but not before Jimmie Downie made his mark by ranking twelfth among the high scorers for the season, while Billy Gray ranked among the leading goalkeepers. You can read more about the fascinating history of soccer and see the source of some of this information online. Below is another team photo of the Falcos near the industrial area where their sponsor and financial supporter, Farr Alpaca Company, were located. You will recognize many of the same faces. Finally, I can remember hearing many of the names of these players mentioned. Not just as local soccer greats of the time, but as friends and associates grown from the comradery team sports ought to nuture. I can recall my father mentioning some of these names, and who knows, as a kid I may have even met some of these men who were friends of my grandfather. In fact, Hugh Hutton, standing directly behind my grandfather in the first photo on this page, second from left above, and fourth from the left below, was the best man at his wedding. 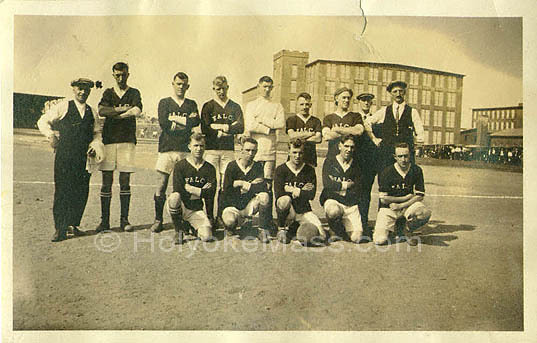 My grandfather went on to help coach the Holyoke High School soccer team at least one year (1924). Below is a photo of some Falcos in their "civilian" dress — somehow I don't think I would dare to say a negative word about the team — they look far more ominous than in the posed team photographs!